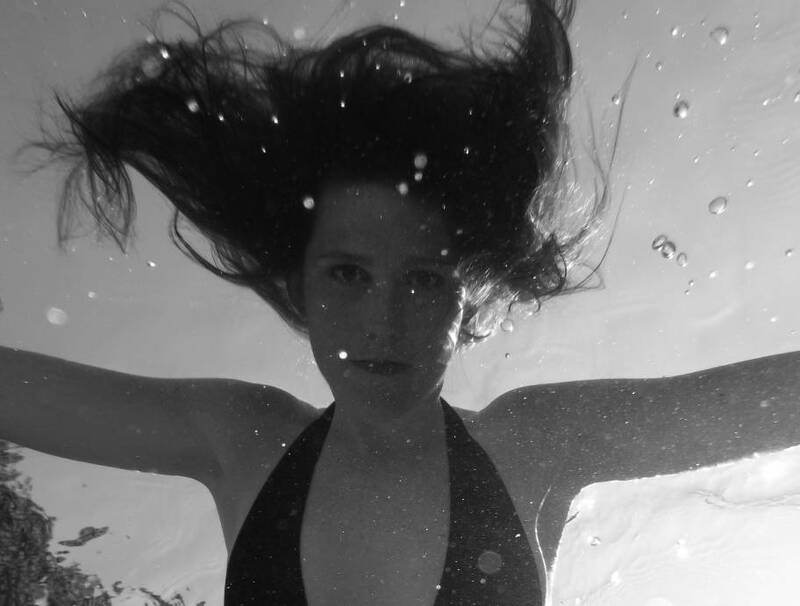 Underwater with Whitney Johnson of Matchess, E+, and Verma. Photographed by Vanessa Gill. Whitney Johnson of the Chicago band Verma and Disappears’ side E+, first released her Seraphastra cassette under her solo moniker Matchess in 2013 on the Digitalis imprint, and is now about to enjoy a wider release from Trouble in Mind Records. On the premiere of “The Need of the Greatest Wealth”, the need for human communion and connective companionship is heard through ascending and descending electric organ scales, Whitney’s vocal wealth of presence, and sensuous outbursts of amplified viola work. And it is “The Need of the Greatest Wealth” that opens up Seraphastra, introducing the modern-electronic-classic correspondences like, “Letters of Blood and Fire”, the blank and unknown spaces of the in-between on, “Grey Nebulous Distance”, the atmospheric secret life of genetic communities on, “Locus Communis”, and the ambient ebb and outbursts of, “Utterly Delightful Cry of Outrage”. Johnson taps into the necessities and complication of human bonds on “Greatest Wealth” that rewards in the spell-breaking shatter of violent cataclysms that expounds upon John Cale’s electric viola section on “The Black Angel’s Death Song”. Whitney’s solo vehicle, Matchess reaches out to make meaningful human contact from the internalized divorce of “Mind of Self-Estrangement”, to a larger metaphysical concept and scale found on the super-natural splendor of worlds in, “The Realm of the Alien Powers”. Matchess implores her listeners to love the alien and the alienated in the name of needs to create a kinship of the familiar in order to find a greater wealth, a greater friendship, through a reconciliation of the self. Over conversations about Karl Marx influences, sun-inspired viola variations, and the need for human communion, we caught up with Whitney Johnson. Stream Matchess, “The Need of the Greatest Wealth” and read our conversation below. What sorts of needs gave birth to the electric, wailing storm of “The Need of the Greatest Wealth”? What exactly is the greatest wealth’s need? The greatest wealth is the other human being! This song is an expression of the need for human communion. That viola explosion at the end of the song is a “sensuous outburst” of emotion, the sound of one being in need of another. Yet, when we search for the smoke of connection, green fire may be the origin, something warped and sinister, burning too hot. Thoughts, anecdotes, best untold stories about recording the album, Seraphastra? When I recorded that viola line at the end, I remember the sun cutting through the window of my practice space, spilling over the roof of an old friend’s apartment, fragmenting into flickering points of light. The re-issue of Seraphastra will be available August 26 Trouble in Mind.